Department of Physiology is milestone in the history of K.G. Medical University and it is one of the most important pillars of medical science. It was founded in 1911 and Lt. Col. CA Sprawson took the responsibility as first head of department of Physiology (1911-1923) and subsequently handed over the torch of wisdom and responsibility to well known scholar Professor W. Burridge from 1923-1946 and then to the following eminent scholars viz Prof. C.P. Mishra (1946), Prof. S.N. Mathur (1946-55), Prof. R.C. 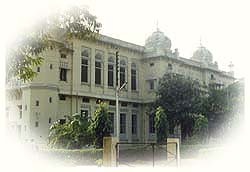 Shukla (1955-79), Prof. S. Kumar (1979-80), Prof. S.D. Nishith (1980-89), Prof. D.N. Khanna (1989-93), Prof. S.N. Tandon (1993-95), Prof. N. Shukla (1995-96), Prof. S. Singh (1996-99), Prof. U.S. Pandey (1999-2004). Presently Prof. Sunita Tiwari ( MD, MNAMS) is carrying the torch of success since 2004.With her vision and endeavour the department is progressing in various fields, setting up clinical laboratories like Neurophysiology Lab with facilities of testing Auditory and Visual Evoked Potentials,Nerve conduction velocity(NCV) & ANS tests.The department has well equipped Molecular Physiology Lab. The department conducts various camps related to Yoga, lifestyle, obesity etc. to help general public and create awareness. The department has also procured the latest model of PFT machine which caters to the patients from the various clinical department and also used for research purposes. She, along with her dedicated team of faculty members and residents is determined to take the department to new heights of Excellence. Under her supervised guidance Physiology department is making continues effort to develop not only as a teaching department but also a number of applied physiology laboratories have been established and some are in pipeline. The department has a rich history and has stallworts in basic science & reasearch such as Prof. A.S.Paintal whose work on J receptor in pulmonary vessel is highly acclaimed other well known personalities are Prof. W. Burridge, Prof. S.N. Mathur,Prof. R.C. Shukla, Prof. S. Kumar, Prof. S.D. Nishith, Prof. D.N. Khanna, Prof. S.N. Tandon and Prof. N.Shukla. Started in 1999 with the help of Electronic Spirometer,in 2001 department aquired spirobank-II, a fully computerized spirometer with in built printer. Patients are referred from department of medicine, TB & Chest. Several MD thesis have been awarded by using the data. Established in September 2003.It is applied for non invasive assessment of cardiac output & blood flow in cardiac failure patient and chronic diabetes patient. Established in 2001. Sympathetic and Parasympathetic component are tested. Patients are referred from department of Ear Nose & Throat. Useful to detect diabetic neuropathy. Patients are referred from department medicine & neurology. Detect several cardiac disorder. Patients are referred from department medicine & neurology. The physiology society is a registered body which carries out several curricular and co-curricular activities round the academic session. The society is presided by the Head of department of physiology and the executive members are selected from the first year students. Every year interviews for several posts of the society are conducted and the most dynamic students are selected for the esteemed posts. Society members organize the events under the guidance of the teachers. Some important events are : Vasant Utsav, quiz competition, chess, picnic, debate, physiology day etc.